Falling sea levels, not warming, is the cause of most bleaching of coral events in 2016. This post by Jim Steele shows how corals are affected by El Nino events when the trade winds slacken that bring weather to the north Queensland region and Barrier Reef. […] Indeed the Great Barrier Reef had also experienced falling sea levels similar to those experienced by Indonesian reefs. 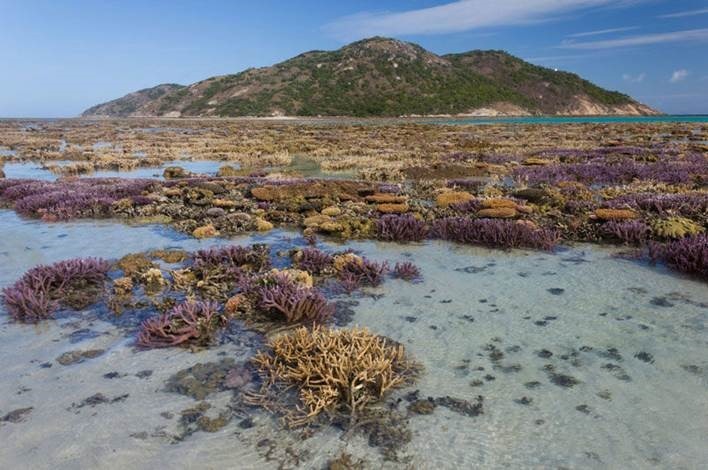 Visitors to Lizard Island had reported more extreme low tides and more exposed reefs as revealed in the photograph above, which is consistent with the extremely high mortality in the Lizard Island region during the 2016 El Niño. Of course reefs are often exposed to the air at low tide, but manage to survive if the exposure is short or during the night. However as seen in tide gauge data from Cairns just south of Lizard Island, since 2010 the average low tide had dropped by ~10 to 15 cm. you may be interested that there was a mass mortality of mangroves in the Gulf of Carpentaria last year also caused in part by a temporary drop in sea level associated with El Nino. It was a huge event. see link below or I can send you the original paper. I should add that I have looked at many of the videos of the bleaching taken from aircraft and it is difficult to see how the figures that Hughes presents are credible. In addition a parallel survey of GBR bleaching done by tourist operators indicated far lower levels than reported by Hughes team. It looks like another example of results we cannot trust. This entry was posted in Broome/Kimberley, Climate, Environment, science, weather and tagged Anthony Watts, climate science, environment, great barrier reef, jim steele, Professor Peter Ridd, research, science, weather. Bookmark the permalink.